Coming Never, to a Toy Shop not exactly near you: the Atomic Starlight Knight, with special "Boot to the Head" action! Yee-haw! As I've told my artist on a few occasions, I have a serious problem with thinking too bigas in, I do it all the time. Esa says that's okay, considering that a lot of people have problems not thinking big enough. Now, I'd be just a regular, run-of-the-mill crazy dreamer if I didn't at least try to take steps to achieve those heavy-duty, quasi-impossible goals I keep telling everyone about. It can be quite puzzling, trying to figure out what, exactly, needs to be set up and done to move the end goal closer. Mostly, though, it involves having an end result in mind, and finding other people that seem to think it'd be a nifty idea. One evening, for example, I was desperately trying to avoid thinking about the class group project that was due the next day while attempting to forget that a couple of major exams wouldn't be far behind. So, in the way of all True College Students, I ignored all of those concerns until the very last minute, opened up a photo editing program and got to work on something that had me laughing like crazy every single time I looked at it. 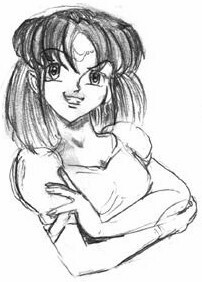 The concept for Galactic Destroyer Maker began as a desperate attempt to relieve stress, and started off as a simple joke, accompanied by a simple script that called for the main character to blast the player into smithereens every time he did something she didn't like. But the point is that one good prod to the funny bone deserves another. Everyone I showed the joke picture to thought it was hilarious and suggested that I go out and make the actual game. So that's exactly what I'm doing. Having worked on an old parody fanfic, Nuke 'Em 'Till They Glow! !, for many years, I can appreciate the usefulness of staying power when telling a really long joke. Some jokes actually tend to get funnier the farther one takes them. Clearly, there are limits when this ceases to be a good thing, but I don't think I've hit that point yet. My brother was the first one to volunteer his programming skills to this project. His words were something to the effect of: "Heh. I could program that for you." Now, several good programmers have joined the project, and it's pretty much my responsibility to eliminate the confusion as to how certainor allaspects of the game are to be handled. That's all well and good, since it was my idea to drag everyone into this thing in the first place; I have to respect the fact that they wanted to come along for the ride. The only one that's really been railroaded into this would be our favorite artist, Esa Karjalainen. None of this would have been at all possible without his great artistic contributions. 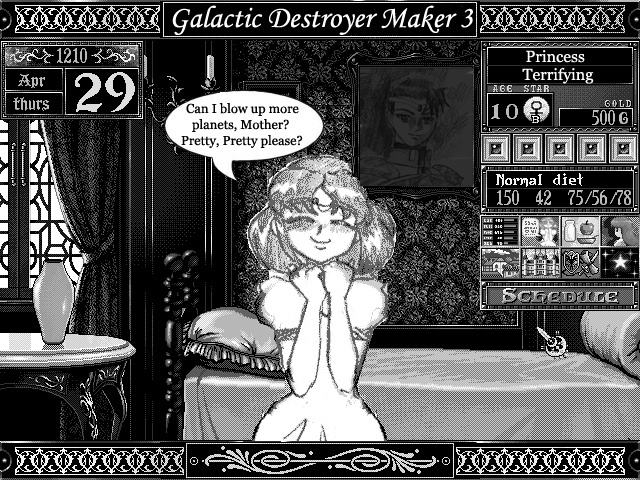 I'm not quite certain what went through his mind when I mentioned that it'll require at least 105 images for the prospective Galactic Destroyer on the main screen to work out wellmuch more if we want to add any more detail like differing hairstyles or figure sizes, but I don't think that'll be necessary for this sort of game. We're still working out details for the all-important adventure and battle modes. Jason Liao has been helpful in suggesting that an official documentation for the game's development to be made, and has offered useful suggestions as to what ought to be explained. We'll get it retooled and more useful pretty soon, we hope. Ammon, the owner of the server, has taken on the responsibility of all things concerning the adventure mode (which will prove quite useful for his planned Generic RPG thing for later), Danny's in charge of the main screen and most of the integration details, and Joseph Fenton's waiting for a definite assignment. The whole thing's being programmed in Java, partly because of its multiplatform capabilities (works on anything, including Windows, Linux, and Mac), but mostly because everyone seems to know it fairly well. We may end up changing it over to C and compiling it for different platforms to improve performance, but for now, Java's good enough for a development language. The most recent addition to the team, Darth Wader, volunteered to work on a sort of War mode to add to the game. There's going to be Final Fantasy-style fights, statistical gains and losses to worry about, and a gazillion parody elements to deal with. It's not so much about raising a wayward child anymoreit's a struggle of life and death against the most obstinate creature the universe has ever seen! Let's see if you can teach her how to dance. The Galactic Destroyer Maker game will be Freeware when done, and Open-Source once we have enough Source for it to be Open. It's being discussed and worked on in an open category in the forum. In the meantime, the comic is still being worked on, as is the NETTG fanfic. The goal for completion of the fanfic is by the end of this summer. Thanks for sticking with us!